My Geeky Geeky Ways: The Many Faces Of The Contemptible Clock King! The Many Faces Of The Contemptible Clock King! Tonight's episode of Arrow brings with it the premier of their take on the classic Green Arrow villain The Clock King. As such, I thought this might be a good time (no pun intended) to look at the long history of the many men to use the name. Surprisingly, there IS a long history of time-themed villains in the DC Universe and various tie-in media. The first Clock King was a man named William Tockman, who first appeared in World's Finest Comics #111 (August 1960). Originally, Tockman was a decent man who doted on his sickly sister. Until one day when, after a routine physical, Tockman's doctor informed him that he had a rare disease and that he had only six months to live. Worried about what would happen to his sister once he was gone, Tockman planned a bank heist to secure enough money to see his sister taken care of for the rest of her life. 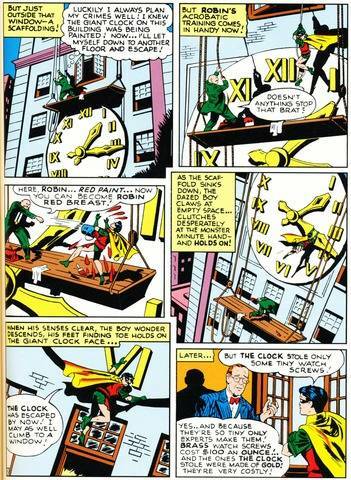 Since he was living on borrowed time and his plans hinged upon his knowledge of the unique timing mechanism installed in the bank's vault, Tockman dubbed himself The Clock King and donned an incredibly tacky clock-themed costume. Tockman was captured by Green Arrow and imprisoned, where he found out that his doctor had accidentally switched his test results with those of another patient and that he wasn't going to do die after all. Tockman's sister died shortly thereafter and Tockman swore revenge on Green Arrow. Unsurprisingly, given his complete lack of training, Tockman was a complete wash-out as a super-villain. He eventually joined up with the version of villainous Injustice League that reformed into Justice League Antarctica. When that didn't work out, he formed his own villain team with a group of even more pathetic villains. Eventually he was enlisted into The Suicide Squad, where he was finally (some would say mercifully) killed in the line of duty. 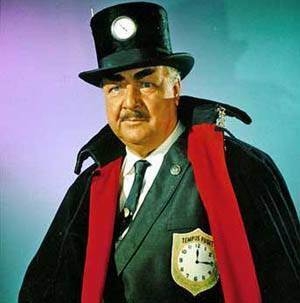 There was also a Clock King on the classic 1960s Batman TV Show. Played by Walter Slezak, this Clock King was named Morris Tetch and made used of time-piece based weaponry and death-traps while trying to steal items relating to time and clocks. Recently, the Batman '66 comic confirmed a long-held fan theory that Morris Tetch was the brother of Jervis Tetch, a.k.a. The Mad Hatter. Most superhero fans today are most familiar with the Clock King from Batman: The Animated Series. 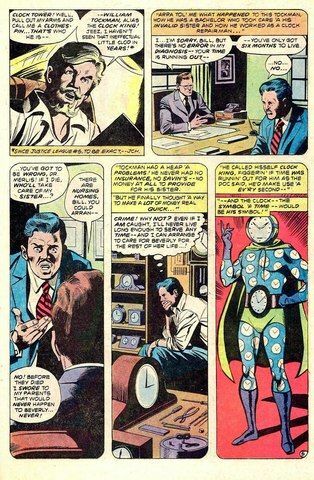 This Clock King - a lawyer and efficiency expert named Temple Fugate (a play on the Latin phrase tempus fugit - "time flies") - blamed Gotham City Mayor Hamilton Hill for having ruined his career. Fugate had no super-powers but was a brilliant analyst who was able to match Batman in a fight after studying footage of Batman fighting and calculating how far in advance he would have to move to dodge Batman's attacks. Fugate was later recruited for Amanda Waller's Suicide Squad in Justice League Unlimited and plotted the team's heist on the Justice League Watchtower. 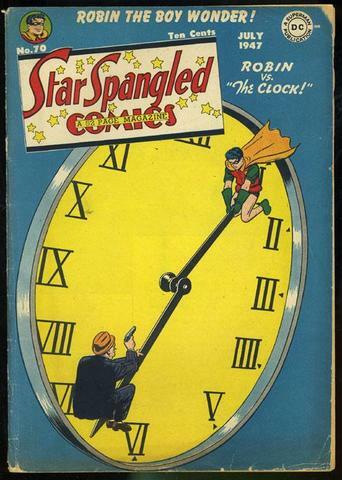 Curiously, Temple Fuget's skill-set resembles that of a Golden Age villain called The Clock, who first appeared in Star Spangled Comics #70 (July 1947) fighting Robin. Like Temple Fugate, The Clock was also a master-planner and strategist. He even fought Robin on top of a giant clock! The Batman: The Brave And The Bold cartoon introduced another Clock King. 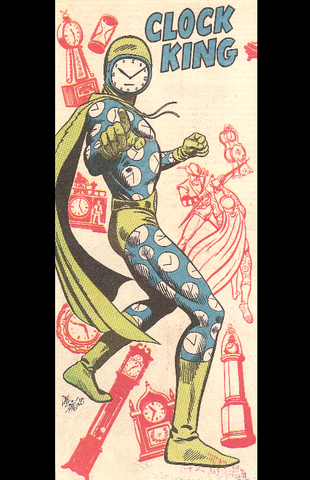 This Clock King had a German accent and dressed in a kingly take on the original William Tockman costume, with a crown and ermine cape along with the traditional clock face mask. There was yet another Clock King, who was never given a proper name or secret identity. He was introduced during Sean McKeever's run on Teen Titans. 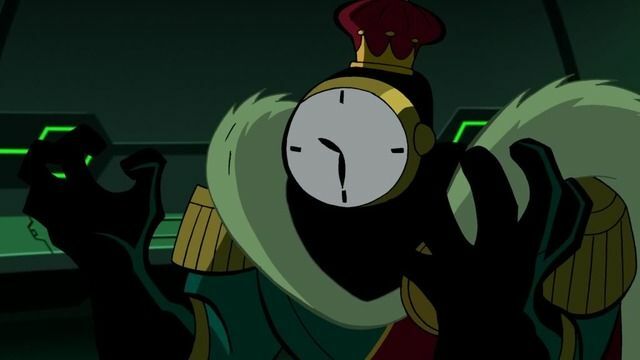 This Clock King was a master strategist but also possessed a weak form of precognition that allowed him to see four seconds into the future and react accordingly. Recently, the New 52 Green Arrow comic has introduced a crime boss named Billy Tockman. Tockman rules the underworld of Seattle along with two other crime bosses, personally overseeing Seattle's waterfront. He has yet to be addressed as The Clock King in the series but the lineage is clear enough. 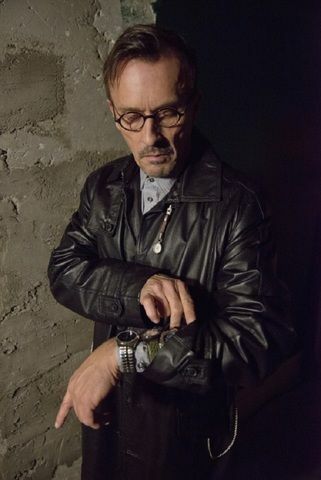 Played by actor Robert Knepper, the Arrow version of Clock King appears to be a mix of the two most famous incarnations of the character. He is named William Tockman but appears to be a master strategist and planner akin to Temple Fugate. 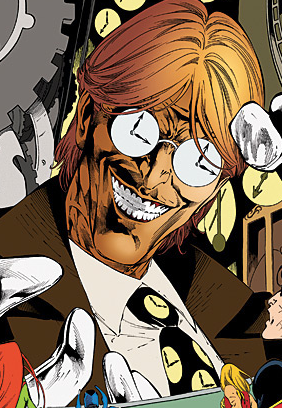 With the previews suggesting this Clock King was created as a foil for Team Arrow tech-expert Felicity Smoak, there is also a faint resemblance between the rivalry between the hacker heroine Oracle and the super-villain The Calculator, who filled a similar role offering strategy for a price to other criminals.